I have no unifying story today so I am just going to toss a bunch of links and info with fun sights and sounds at you. Let’s start with Sound. Have you ever wondered how exactly to say “EA Sports. It’s in the game.”? Well Andrew Anthony, the guy behind the words, is willing to teach you. Next stop on the multimedia parade is Light, as in High Powered Flashlight. A New York Metropolitans fan is in jail this weekend for aiming a flashlight at Tim Hudson and Edgar Renteria. Turns out that for disrupting a sports game in NYC you face a year in jail and a $5000 fine. For more history check out the Fox Sports article. Thirdly I’ll go with Images. Tonight Daisuke Matsusaka is facing off against another rookie, Chase Wright. But I don’t think DM is worried about facing the Yankees. 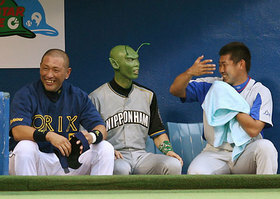 He has played on the same team as an alien. I think if you can get past that you can survive the YANKS-SOX media frenzy. And lastly, I will leave you with Poetry from Jake “The Snake” Roberts. What does a thief gain?